British drivers set the Guinness World Record for driving a car through the most countries on a single tank of fuel. Also, an artist decorates peripherique during road works. Upset as EU abandons road safety target. Dover-Calais operator MyFerryLink ‘admits defeat’. More than seventy drivers fined after foggy 130-vehicle fatal crash in Belgium. Standard Audi drives 1155 miles through fourteen countries on one tank of diesel. ‘It’s amazing how far you can go’ is the @DriveEurope tag line but we might have to change it to, ‘It’s amazing how far you can go on a tank of fuel’. A completely standard Audi A6 Ultra diesel has just completed an incredible 1155 mile journey through Europe after a single 73 litre fill-up. Piloted by Daily Telegraph motoring writers Andrew Frankel and Rebecca Jackson, and supported by motoring organisation RAC, by passing through fourteen countries the drive has set a new Guinness World Record. The attempt started yesterday morning at 09:30 in Maastricht in the southern Netherlands before heading south through Belgium, Luxembourg and France then across Switzerland to Liechtenstein and Austria. Apart from the inevitable fatigue, the only issue seems to have been the detour around the S16 Arlberg Tunnel in western Austria which is closed for refurbishment until November. The drive over the 1793m Arlberg Pass, in the dark, was dogged by thick fog. The pair then headed into Italy, Slovenia, Croatia, Bosnia and Serbia before the finish in Hungary. The route was designed by Simon Hepinstall (@SHepinstall) who previously held the world record for driving through the most countries in 24 hours (twelve). An extra headache was having to negotiate through the Alps while keeping on the flat as much as possible. The drive also had to be continuous to prevent the car cooling down during stops and consuming extra fuel on re-starts. The drivers took breaks in a RAC support vehicle. The finish was truly nerve wracking. As the car approached the Serbian border the fuel tank already showed empty. Despite this, the drivers managed to coax it another nineteen miles to Hungary. More: a Norwegian trio claimed a new world record for visiting the most countries in 24 hours – nineteen – last September. Meanwhile, another British pair, @FergalandJulian are currently attempting to set a new Guinness World Record for Fuel Efficiency – on the Honda Real Fuel Challenge – with a 13,000km drive through 24 EU countries, expected to finish on 25 June. 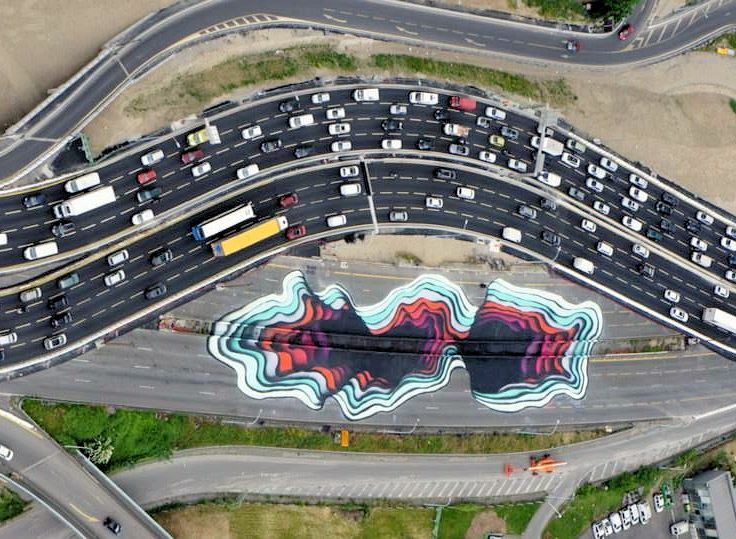 German artist 1010 was called in to paint one of this characteristic ‘trompe l’oeil’ craters during the recent realignment of the peripherique at Quai d’Ivry in south east Paris. The road has been moved to make way for new apartment and office buildings. Photo: 1010 Art, Facebook. roundup: ROAD SAFETY. Considerable upset this morning after it emerges the European Commission is preparing to drop an expected new target to cut serious road traffic injuries. The European Transport Safety Council has written to EC President Jean-Claude Juncker to complain. It says life changing injuries rose by 3% last year, to more than 200,000 people, even as road deaths continue to fall, and calls the target ‘simple, cheap, non-controversial and necessary.’ It is not clear at this stage why the EU wants to abandon its well-flagged plans. An earlier ambition, to cut road deaths in half 2010-2020, remains. CROSSING THE CHANNEL. In the words of one observer, Dover-Calais operator MyFerryLink has ‘admitted defeat’ and says it will cease operations from 2 July. Bookings after this date will be transferred to another operator it says. Backer Eurotunnel finalised a deal at the weekend to sell two of the firm’s three ships to rival DFDS. It will keep the third to supplement its service through the Channel Tunnel. BELGIUM. Seventy two drivers have been found guilty after the 130 vehicle pile-up in thick fog on the A19 near Ypres in December 2013 reports Flanders Today. Three people died and nearly seventy were injured. Most of the drivers received fines of between €120 and €600 but two truck drivers were given six month suspended sentences. The judge said they had all failed to adapt their speed to the conditions and leave a safe distance to the vehicle in front.